Stephen Hiss is president of Stephen Hiss Radiology Management Consulting, LLC. He has more than 30 years of experience in managing imaging services at level 1 trauma centers, academic hospitals, tertiary care centers, community hospitals, and freestanding facilities. He has authored two textbooks, Introduction to Healthcare Delivery and Radiology Administration and Understanding Radiography. His third book, Management by Fable, was scheduled to be published this fall. This article is drawn from a larger interview with Hiss entitled “In the Big Picture, the Little Things Matter,” published online at www.RadiologyToday.net/digitaleditions.shtml. The government is increasing scrutiny over imaging and reducing reimbursement. At the same time, an aging population requires more imaging services. Commercial payers and government are putting a more watchful eye on referring physicians about which exams are appropriate and should be ordered. While imaging organizations react to the rumblings from these shifting tectonic plates, they risk diverting their attention from providing the top-quality customer service that may be their tool for succeeding in a competitive marketplace and a tough economy. The following seven tips can help your facility improve customer service performance. 1. Don’t lose sight of the basics. The primary leverage most radiologists can wield is to provide the most broad, the smartest, and the most accessible service possible. 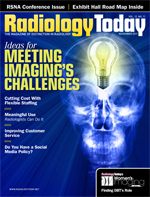 It usually boils down to the things they do every day because that service aggregates into an appealing radiology group profile, which allows them to succeed as an independent group or within larger multispecialty organizations that are beginning to emerge. A radiology group’s strength and ability to manage these different external forces usually come from how they do business every day. They need to recognize the basics and not be distracted from them and then use intelligent approaches to enhance the quality of work they provide. Provide a broad scope of services that are conveniently located for referring physicians and patients. Have a radiology service that is really focused on things like taking a quick consulting call from a referring physician to answer his or her questions. It’s close to the holy grail for a referring physician to be able to pick up the phone, dial one number to a particular radiology group and, with little hesitation or delay, get answers to what test was ordered or get clarification on an interpretation. The same thing applies to patients. It’s great for them to have a source in the radiologists’ office to call and get answers to their questions about test prep or whatever question they may have about an upcoming test. Patients want a resource at the office whom they can contact and get good information without delay. That kind of information makes its way back to the referring physician and strengthens the radiology practice tremendously. 2. Do the job as well as you think you are doing it. As soon as a radiology group begins to think it is doing everything possible and has met the standard, it’s time to start worrying about that standard because somebody else could be looking at your niche and what more they could be doing. The people I’ve found to be successful are the ones that as soon as that notion of “mission accomplished” becomes part of the thinking is exactly the time when they start to worry and think, “What else can we do?” Marketing information can really help. Have people go out in a smart way with appropriate frequency to do reconnaissance. Do patient survey groups. Ask your marketers to visit referring office managers and office staff to make sure the service you are providing is exactly what they are seeking. Ask if there is anything that is not being provided that they might be looking for from a radiology practice. There are so many things that practices take for granted as being OK because everyone is worried about contracts and external forces. It is very easy to lose sight of how important picking up the phone on the third ring may be. And you need to have the work environment of the person who picks up the phone in place so he or she can answer the phone quickly. The background work that person is doing has to allow them to answer the phone—that is often overlooked. If it takes a long time to pick up the phone, patients get angry and referring physicians get frustrated. The minutiae of day-to-day operations are too important to get lost by overthinking the big picture. Building on such little things and making them as user friendly as possible is something that both referring physicians and patients will recognize. 3. Look at things from the bottom up. Management often thinks about things from the top down, but very often looking from the bottom up can provide answers. One step groups should take is to talk with the people answering the phones, those taking appointments, and those who are talking with patients about their billing problems. The first step is to get these frontline workers in a focus group and ask what’s working and what’s not working as well as how they feel about what they’re doing. Staffers’ personal feelings are important and, in one way or another, will telegraph their emotions into communications with patients and referring physicians. That is important because if you have an employee who is really not happy with what’s going on, the best process in the world will not translate as well to a physician or a patient. The signal callers receive is simply not as positive as it is with a happier person. If you have a person doing billing and they’re not happy about their work environment, they won’t be as friendly on the phone and are less likely to take the time that is needed. It’s not only the process that I would try to ask about in the meeting, also try to take the temperature of the work environment. What are your employees griping about while they’re driving home? That’s the stuff you want to know about. You can’t make everyone happy with everything, but if there are things that are reasonable that aren’t being taken care of, try to address them. Talk to the people who are doing the frontline work day to day and understand what they think about how they’re doing things and what they think could work. There’s a pool of knowledge with those people that shouldn’t be underestimated. 4. Be cautious about extended hours. It is easy to go too far in an effort to provide convenient locations and hours. You want to give patients the benefit of flexible hours and locations, but that has a cost. Talk with office managers and the people in referring physicians’ offices who schedule imaging cases. What are patients saying to them? What are they looking for as far as hours with their schedules? You also need to look at volume. Identify which locations and what shifts seem to be using resources as efficiently as possible. Don’t be afraid to take away or add hours as needed, depending on what you find out. There are financial implications to running offices for extended hours. 5. Send a letter. If you do your marketing internally, start with a good letter on office letterhead to the office managers and staffs of referring physicians. It goes back to communication. You want them to know what services you provide as well as any changes that have been made and why they’ve been made. Show them that your practice has its ear to the ground, is aware of changing service needs, and is willing and able to make adjustments when necessary. 6. Educate referrers. A simple quarterly newsletter to referring physicians can describe interesting cases you’ve come across. For example, you might tell referrers a story of how one particular patient presented this way and we did this imaging and it didn’t work, but then we used this imaging regimen and it was exactly what was needed. You have to do it in a HIPAA-compliant fashion, of course. You could include write-ups describing interesting cases from the journals, with credit of course. A regular publication of some sort for referring physicians can be valuable. Doing a luncheon or evening seminar once or twice per year is also a great thing to do. Or a website can be an excellent educational medium. In addition to being an educational piece, it’s also a marketing piece telling customers what the practice is doing, describing new equipment, and telling referrers about new techniques. Education of this kind is good marketing. 7. Remember that people are at least as important as process. Today there is so much emphasis on process and outcome that you can lose sight of the need to understand some very basics of human nature. People are as much a part of the process as the process. In fact, paying attention to people is as important—in some cases more important—than the process that is trying to be developed. Too often, managers don’t pay as much attention to the “people aspects” of operations as they should.